20 February 2015, at 10:51a.m. US and CANADA - Both the US and Canada exported less pork in 2014, as trade was disrupted by PEDv and the Russian bans, among other factors. 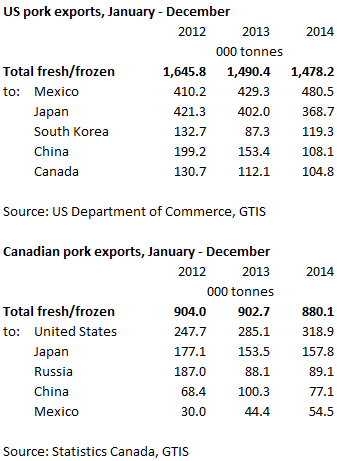 Throughout 2014, pork trading in the US followed the trend of the previous year, with imports increasing by 18 per cent as exports were down one per cent. This reflects a growing domestic demand, which could not be met by disrupted domestic production due to disease. However, with limited availability but sustained demand, unit prices for US pork were up 11 per cent on the year and by much more than this in the middle part of the year. This brought the total value of pork exports in 2014 to $4.9billion. Mexico continued to be the leading importer of US pork, increasing the volume taken by 12 per cent on the year, as its production was hit by PEDv too. Japan, while still in second position, received eight per cent less US pork. South Korea expanded its intake by 37 per cent, overtaking China, as its productivity was also disrupted by disease and poor producer margins. Exports were particularly sharply down in the second half of the year, as Japanese and Chinese markets weakened, partly due to increased competition from cheaper EU pork, aided by the weakening of the euro against the dollar. Canada followed suit with exports falling three per cent on the year, although imports were also down four per cent. With PEDv reasonably contained, production has not been as drastically disrupted as in the US. However, unit prices have increased in line with US prices, pushing the value up to C$3.1 billion for the year, with the fourth quarter providing the greatest volume of exports. Canada played a part in supplying the US and Mexican shortfalls, with deliveries up 12 per cent and 23 per cent respectively. The impact of the Russian bans has meant exports to this market were little changed overall, having doubled in the first half of the year after the EU ban and then dropped sharply in the second half when Canada, in turn, was banned. There were varying trends for Asian markets as Canada faced increased competition from EU pork but was able to divert supplies which would previously have been destined for Russia.